What are the secrets of pleasure one may derive from smoking a premium cigar, and why are cigar enthusiasts willing to invest not unsubstantial sums of money in acquiring them? Naturally, because of their unique tasting qualities which cannot be found in any other delicacy. 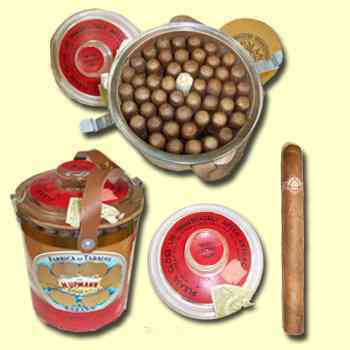 But there is more to the story than that: a great cigar offers a variety of pleasures for all of the smoker's senses. Cigar aficionado Ruby Zasler discusses his experiences and viewpoints on the aesthetic aspects of cigar smoking. Many years ago, before I began to indulge in the delights of cigars in general, and Habanos in particular, I, along with myriads of cigarette smokers and non-smokers, thought of cigars as oversized, unmanageable stink weeds, and wondered what enjoyment one could possibly derive from them. Even today, notwithstanding the increased publicity the cigar has received, as well as the marked increase in the number of cigar smokers, I would venture to suggest that most people outside Cuba and Spain have no idea as to what cigar smoking entails, nor do they bother to make any distinction between that and cigarette smoking. The proof of this is just about everywhere: in the anti-smoking laws being legislated and enforced; in the life insurance policies of most insurance companies; in the taxes imposed equally upon all tobacco products; in the unsubstantiated health warnings which deface otherwise beautiful cigar boxes. Worse still is the fact that in the days before the public smoking ban, there were several places, such as airplanes, certain restaurants and airport V.I.P. lounges where one could puff away on a cigarette, but not on a cigar, heaven forbid. I was sitting with my wife in the well-ventilated smoking area of a charming little restaurant, and had extracted a Habano (I believe it was a beautiful Partagas Lusitania) from my leather cigar case after having partaken of some sumptuous dining. Three out of the five people sitting round an adjacent table had been smoking cigarettes, and one of them offered a comment which was quick in coming: "Are you trying to kill us with that thing?" My retort, chiefly inspired by anger and cynicism, was, "No sir, but you seem to be doing a highly competent job of that all by yourselves." While there is no doubt that cigar smoke genuinely disturbs a certain percentage of the population, I would conjecture that the overwhelming majority of objectors are psychologically, rather than physically distressed by it. After all, they have been bombarded for years with an incessant flow of virulent anti-smoking propaganda (much of it unsubstantiated), and undoubtedly have been exposed to cigar smoke from sticks which were, shall we say, of somewhat less than premium quality (machine-made or "dry"). Permit me another anecdote to demonstrate the point: when I was a new Israeli immigrant studying Hebrew in what is called an Ulpan class, one of my classmates, a gentleman from Mexico, was, according to his claims, rather sensitive to tobacco smoke. It was therefore agreed that no one would light up during the lengthy study sessions. One morning, shortly before the first break, another student fished a cigarette from his pack in anticipation and inserted it between his lips. Upon seeing this, the Mexican began to lose it - screaming, shouting, his entire body flailing about like a wounded bear. Attempting to restore calm and sanity, I pointed out the fact that the cigarette was still unlit. His reaction to this was, "But he's threatening to smoke it!" And so it is, concerning the reason a cigar enthusiast partakes in the leaf, for the enjoyment provided by a great cigar is psychological (abstract) as well as physical (concrete). Yes, it is physical - but not in the sense of providing a bodily need such as a nicotine fix - but rather in the employment of all the bodily senses in order to achieve the psychological: sight, smell, touch, and, of course, taste. In a word, then, the pleasure of the cigar smoking experience is a totally aesthetic one. Not a few cigar commentators have compared smoking a premium cigar to sipping a vintage wine, or consuming a gourmet meal. I opine that such a comparison is entirely valid, for the enjoyment of a fine wine or an excellent meal encompasses several of their physical attributes: the hue, nose and flavours of the wine; the aroma, arrangement, texture and taste of the cuisine. A premium cigar is much like a superb wine or magnificent meal, for it tantalises the very same senses; it can thus be appreciated to a fair extent even before it is lit, and after it has been smoked. Love at first sight As a tot growing up in Brooklyn, New York in the late 1940's, I was coerced into accompanying my mother on daily excursions to the neighbourhood candy store (sweet shop) where, unfortunately, she would purchase her "dosage" of two or three packs of cigarettes. As memory serves me, I would first gape at the variety of small toys which were always for me a mere dream, and then shift my attention to the array of cigar boxes: those that were closed, displaying curious, interesting labels and symbols, and those whose lids were open, revealing their colourful, artistic lithographs and logos and, of course, the rich assortment of the cigars themselves in all their glory. 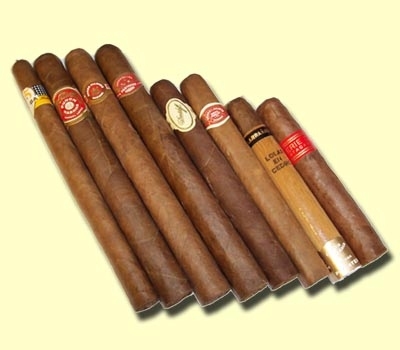 I can well remember brown and green cigars, thin and thick cigars, long and short cigars. I can still recall the sight of "naked" cigars sans any type of covering, as well as those wrapped in thin, shiny cellophane. I especially call to mind the cigars "imprisoned" in metal and glass tubes. All of them impressed me tremendously, as if well-disciplined soldiers lined up for inspection in perfect rows within their barracks. Accordingly, it could be said that even as a toddler, I was able to find enchantment in the appearance of cigars - a budding aficionado. Nowadays, no less than previously, I am ever fascinated by the diversity of colours, lengths, widths and textures of hand made premium cigars. Cigar book wisdom would have us believe that one cannot know how a cigar will taste by its olfactory qualities, or lack thereof. I know not whether this can be proved or disproved, but one thing I do know from personal experience: if a cigar does indeed have a pleasant bouquet, it will almost certainly provide an excellent taste - and this is due to the fact that it has had time to age somewhat, enabling its tobacco oils to be secreted and to intermingle. Hence, whenever I intend to purchase cigars in a shop, or have received a shipment by post, I always check three items: production date, the presence of "bloom" ("plume") and the existence of a fragrance. Most unfortunately for me, I am totally incapable of detecting the aroma of cigar smoke (although my Beautiful Wife is, and enjoys it greatly), so I must content myself with a cigar's scent prior to kindling. This fact conveniently leads into my final anecdote: approximately fifteen years ago, I visited a cigar shop, one of only three in my country which were selling Habanos at that time, the proprietor of which having been one of the two Habanos importers. (There are currently three, including an official one.) While I was browsing in the humidor room of the shop and inspecting and sniffing various Habanos, the proprietor entered, stared at me, smiled and shook his head. "Is there anything wrong?" I enquired. "You cannot judge a cigar's taste by it's smell," he replied. "No," I clarified, "I am trying to detect an aroma as a sign of aging." "You really don't know much about cigars, do you?" he asked. "Perhaps not," I replied, "After all, I've been smoking cigars for a mere fourteen years. And how long have you been smoking them, sir?" His answer was, "I've never smoked a cigar." "Why am I not surprised?" was my touche'. When I lift the lids of my humidors twice a day, in order to "allow the cigars to breathe" and to check the relative humidity and temperature inside, I love to inhale the wonderful perfume of aging cigars. I, like many other cigar lovers, am also fond of sniffing a cigar after it has been clipped and before it is about to be smoked, for this, too, adds to the aesthetic appreciation of the smoking experience. Â I take pleasure in quoting Vahe Gerard extensively on the subject of cigar aesthetics. He says the premium cigar "...is more than a cigar, it is a world unto itself. A world of such richness, that, as with all products catering to good taste and refined living, it requires some attention and culture to be fully appreciated. ...The pleasure of a cigar does not simply consist in smoking it, even when tasted with all the care and respect it deserves...Sight, firstly, allows us to appreciate the cigar's amber hue as well as its quality and craftsmanship. Touch then evaluates the degree of softness and smoothness that indicate the life of the cigar. Of course, the sense of smell comes into play by detecting woody, fruity, or spicy notes even before lighting, and fully savours these aromas during burning. Hearing also 'savours' the cigar: the rustling of the embers that precedes the sound of the lighting. Finally, and most importantly, is taste - which...produces a supremely pleasurable sensual encounter." To all this I would add in the factor of aging, which, as with a prime cut of meat or a vintage port, serves to immeasurably enhance the aesthetic value of almost all premium cigars. Hence, I am always quick to disagree with the philosophy "if you've got 'em - smoke 'em." Setting aside a certain percentage of one's inventory for aging will guarantee a supply of smokes capable of providing optimal delectation. The gratification one receives from a premium cigar is in direct proportion to the amount of patient care one invests in one's entire "relationship" with it - including selection and purchase, and proper storage, aging, clipping, kindling and drawing. All of these procedures, rather than being a series of bothersome practices, are best perceived and experienced as a progression of rituals which take on an aesthetic value of their own. Â Having taken the very last puff , the smoker's taste buds are satiated, yet sense the aftertaste of the rich, complex flavours. Fully contented and totally at ease, he/she may ponder all that has been sensed since the cigar was extracted from its humidor. However, the story need not end at this point, for one can document one's smoking experience by means of a cigar dossier, or something similar. Several aficionados protest that such documentation is a bothersome waste of time, but I beg to disagree. If one has enough energy to capture a family occasion with a camcorder, if one has enough will power to attach photos to a page in a photo album, if one has enough patience to purchase a souvenir at a shop, and - most importantly - if one has enough time to properly savour a premium cigar - then devoting a few minutes to recording some facts and impressions should not be extraneous. Just as a photo album, video recording or souvenir can serve as a remembrance of a special family occasion or enjoyable vacation, a cigar dossier enables one to conserve a memento of one's aesthetic rendezvous with a premium cigar. The senses for to tantalize. Brief Candle of incense to savour!